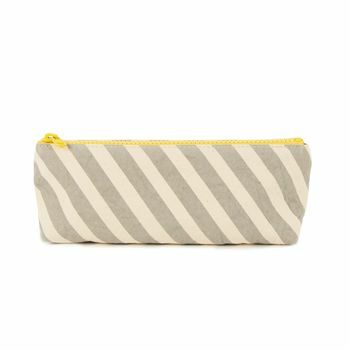 Fun and funky pencil case made from high quality organic cotton with a yellow, water resistant, polyester lining and chunky zip closure. 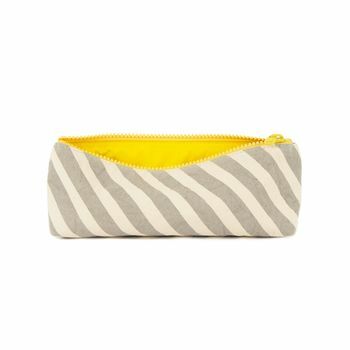 Fun and funky pencil case made from high quality organic cotton with a yellow, water resistant, polyester lining and chunky zip closure. Can be used for lots of different items - great as make-up bag, or for organising every day essentials. Smart grey stripe design printed with low impact, azo free dyes. Approximate size: 7.5cm x 21cm x 5cm.